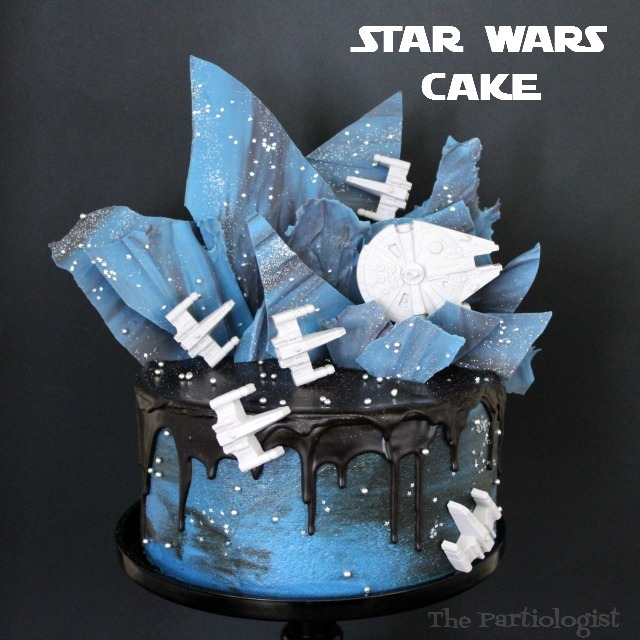 The Partiologist: Star Wars Cake! 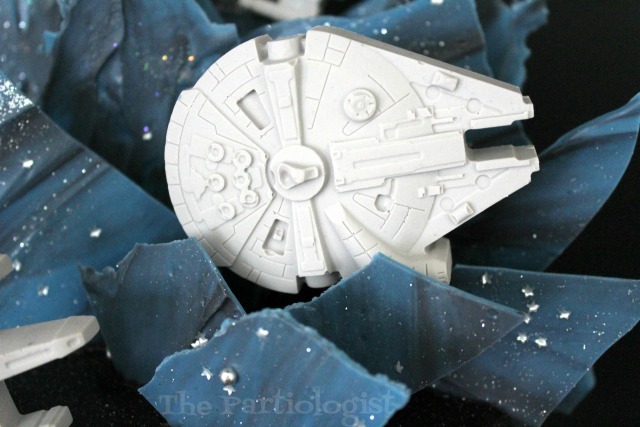 You've seen the cute Minnie Deviled Eggs, and the cute Mickey & Minnie Cookies along with the Disney Themed Dessert Table, but have you seen the Star Wars Cake? When my sister came into the kitchen, she couldn't believe her eyes. Come to the dark side and you'll see just what I'm talking about. 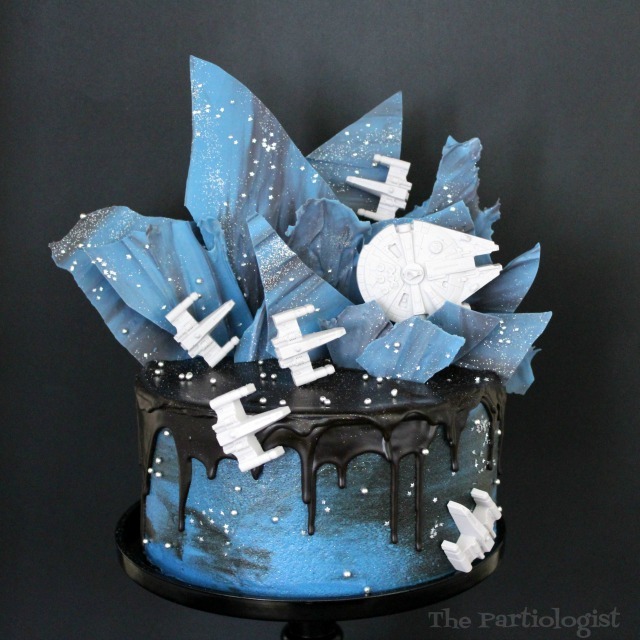 When I found Star Wars drip cakes on Pinterest, I knew I wanted to recreate a version of my own. Come to the dark side. You'll be sooooo glad you did! The dark side of this cake included chocolate cake, chocolate ganache and layers of chocolate candy melts and chocolate toppers. 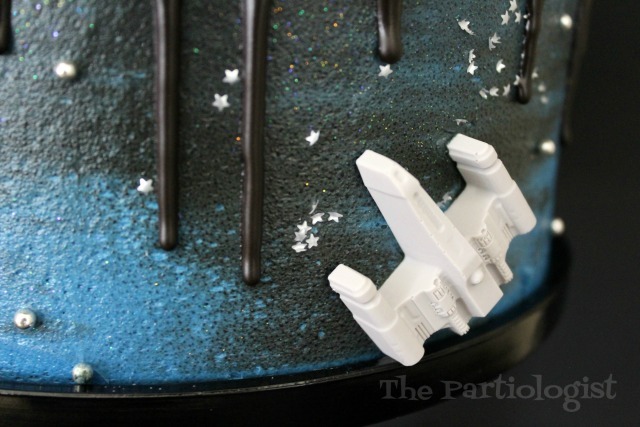 I made the space ship cake toppers out of melted candy melts (use white with a touch of black to get the grey). Poured it into the molds, froze and removed. Whew, they were done and set aside. Then I waited a bit more to get up the courage to make the cake. 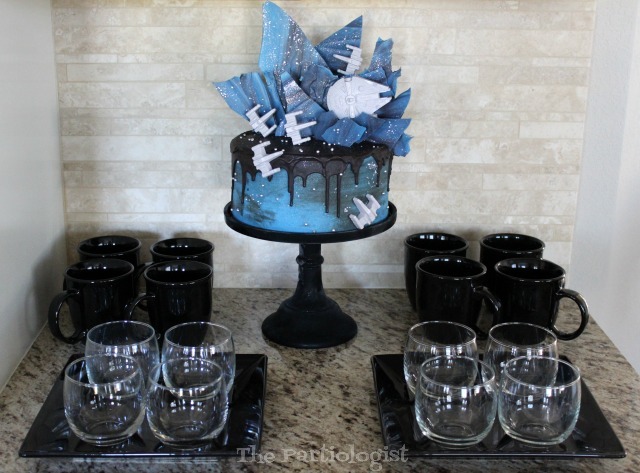 And I had a black glass cake stand, to support the galaxy. And I loved the little X-Wing Fighters. That's what they are, right? I'm pretty sure this is the Millennium Falcon. I really planned to make a tutorial, but I was concentrating so hard on not messing up, I didn't take many photos. 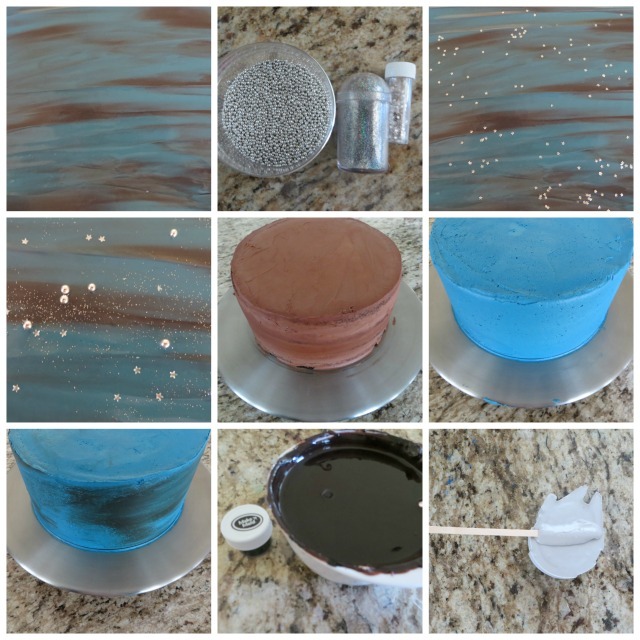 I started by making the pieces to stick out of the cake, from blue and black candy melts. First I poured the melted blue candy melts across the counter on wax paper. I topped the blue with a few globs of black candy melts and spread together, being careful not to totally mix. Then I sprinkled the sheet of candy melts with silver dragees, edible stars and edible glitter dust. After the sheet of candy melts hardened, I broke it apart and set aside. I baked the cakes (several cakes because they kept sinking). Stacked two and frosted with the best chocolate frosting. Then I mixed white buttercream with blue food color and covered the chocolate frosting. Added a few globs of black buttercream to the top of the blue frosting and spread together. At this point, I was tired I took a break, put the cake in the frig. While the cake was in the frig and I was done with my break, I made a chocolate ganache. I colored the chocolate ganache using black candy color. NOT black food color, black candy color! Let it cool, not to thick, or not too thin...just right. Then it was ready to pour. Or maybe I should say until I was ready to pour. I poured the black ganache in the middle and spread it to the edge and over. Let it drip a little at a time. Now you know why I got too tried to take photos, right? I broke apart the sheet of blue/black candy melts and stuck it into the cake. Added a stick/toothpick to the back of the candy space ships with a dab of candy melts. 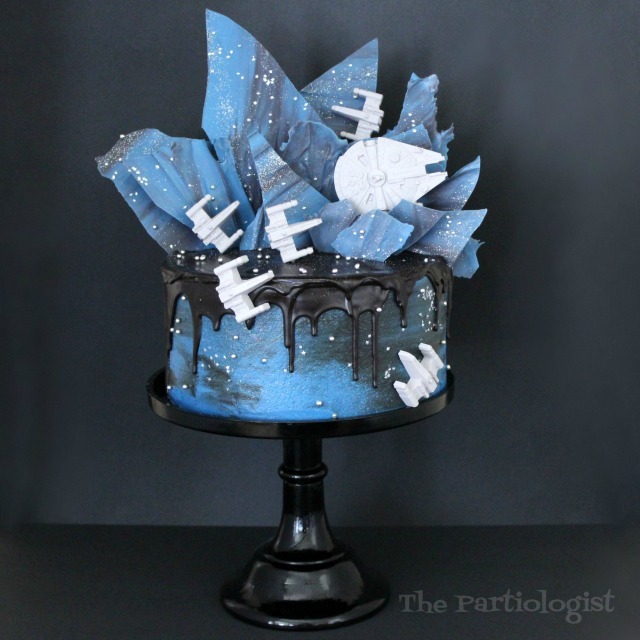 Stuck them into the cake and the galaxy was complete. If you have any questions, please leave a comment and I'll be happy to help. With cups for coffee and glasses ready to be filled with galactic beverages. On it's on little counter. 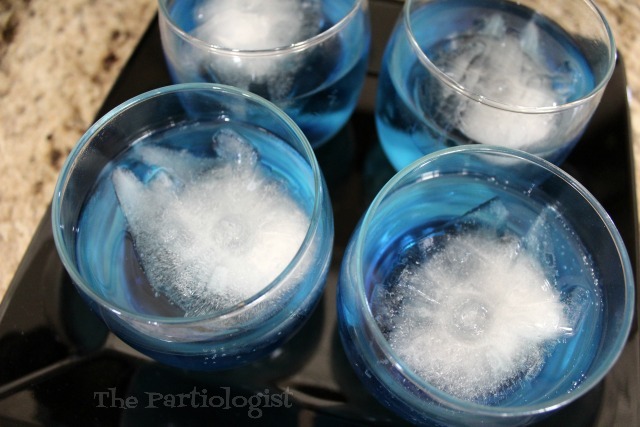 I used the mold again, this time to make Millennium Falcon Ice Cubes. I put a drop of blue food coloring in the bottom of each glass. 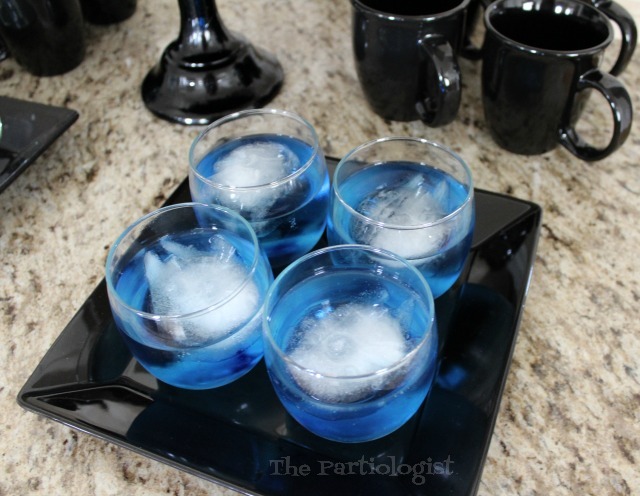 When the guests arrived, I filled it with the Falcon ice cube and 7-Up. Which bubbled when I first poured it on, so cool! It was out of this world delicious! That is such a cool cake. The colors are perfect and the light grey spaceships really pop. I'm loving this cake! Definitely saving it to Pinterest for inspiration on my grandsons next birthday! Oh, I know your grandson would LOVE this cake!! 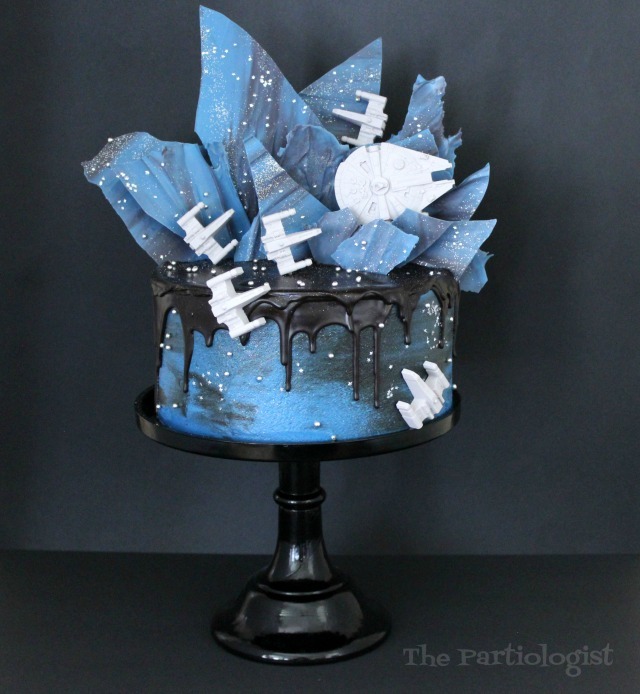 You really are the Partiologist..this cake is just..WoW! 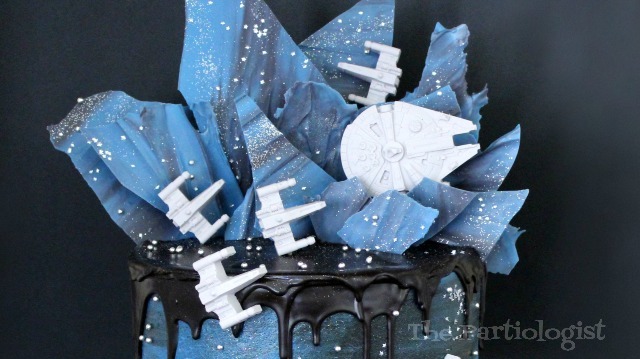 I'm not a Star Wars movie fan, but I am a fan of your beautiful cake! You are so talented - this is amazing! What an amazing, gorgeous cake!! It's just fabulous, especially the glittery blue pieces! Hoping my daughter will want to try to recreate it with me. Congratulations, the force is definitely with you!! Wish you were close by, I'd give you some glittery blue pieces, I made waaaaaay to many! :) I hope you have fun with your daughter recreating it, thanks for stopping by! Can you tell me what type of black candy color you used? Is it the candy melts or something else? The black drizzle is chocolate ganache colored with black candy food color. There is also a link to the ganache recipe in the post.